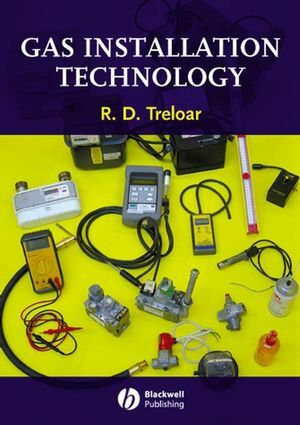 This book provides the definitive text for students taking NVQ gas installation and plumbing courses. It presents essential information in a concise format and the text is well illustrated with diagrams and photographs. It should provide the first textbook aimed solely at students learning the subject of gas and follows the same approach as Roy Treloar's highly successful textbook, Plumbing. It covers domestic, commercial and LPG installations. Roy Treloar has been in the mechanical service industry since leaving school in 1973. He became a full time lecturer, teaching plumbing in 1985. He is currently Team Manager: Mechanical Services at Colchester Institute where he is responsible for all plumbing, heating and gas training and assessment programmes. He has played an active part in external verification for the City & Guilds in both the plumbing and gas schemes and is author of the highly successful NVQ textbook, Plumbing, also published by Blackwell’s. Introduction; Acknowledgements; Abbreviations & acronyms used;. Part 1: The Gas Industry; Working within the Gas Industry; Nationally Accredited Certification Scheme for Individual Gas Fitting Operatives; Required ACS Assessments & Flowcharts; Legislation Affecting the Gas Installer; Industry Documents & British Standards; Gas Safety (Installation and Use) Regulations; Part 2: Gas Utilisation; Gas: Its Origin; Characteristics & Properties of Gases; Liquefied Petroleum Gas (LPG) The Combustion Process; Air Requirements for Combustion; Products of Combustion; The Gas Flame; Flame Pattern & Characteristics; Atmospheric Burners; Pre-mix Burners; Gas Pressure & Flow; Gas Pressure Readings; Quick Guide to Uses of the Manometer; Pipe Sizing; Gas Rates & Heat Input; Quick Guide to Gas Rates & Heat Inputs; The Physical Laws of Gas; Measurement of Gas. Part 3: Gas Controls; Quarter Turn Gas Control Valves; Screw Down Gas Control Valves; Spring Loaded Gas Control Valves; Electrically Operated Gas Control Valves; Heat Operated Gas Control Valves; Pressure Operated Control Valves; Low & High Pressure Cut-Off Devices; Pressure Regulators; LPG Regulators; Flame Supervision Devices; Testing Flame Supervision Devices; Thermostatic Control; Multifunctional Gas Valve; Ignition Devices; Vitiation Sensing Devices; Pressure & Flow Proving Devices. Part 4: Installation Practices; Polyethylene (PE) Pipe Jointing; Copper Pipe Jointing; Steel Pipe Jointing; Semi-Rigid & Flexible Pipe Connections; Gas Service Pipework; Connections to high Rise Buildings; Gas Meter Installations; Commercial gas Installations; Internal Installation Pipework; Pipework Laid in Floors; Pipework in Walls; Pipework Support & Allowance for Movement; Timber Framed Dwellings; LPG Storage & Supply; LPG Cylinder Installations; Storage & Transportation of LPG Cylinders; LPG Bulk Tank Installations; Gas Supplies from a Bulk Tank Installation; Pipe sizing LPG Installations. Part 5: Tightness Testing & Purging; Tightness Testing & Purging; Test Equipment; Tightness Testing with Air (Domestic); Tightness Testing & Purging with Natural Gas; Tightness Testing & Purging with LPG; Strength Testing for Commercial Pipework; Commercial Tightness Testing; Direct Purging Commercial Pipework; Commercial Purging Procedure; Indirect Purging using Nitrogen (N2) Part 6: Flues; Flue Classification; Flue Materials & Specification; Natural Draught Open Flue Systems; Installation of an Open Flue; Minimum Open Flue Heights; Open Flue Terminal Design & Location; Condensation within Open Flue Systems; Brick Chimneys; Flexible Stainless Steel Flue Liners; Pre-Cast Flue blocks; Flue Pipes; Fan Draught Open Flue Systems; Shared Open Flue Systems; Checking & Testing Open Flue Systems; Room Sealed Flue Systems; Fan Assisted Room Sealed Flue Appliance; Room Sealed & Fan Flue Terminal Positions; Shared Room Sealed Flue Systems; Fan Dilution System; Flue Gas Analysis; Testing Equipment for Flue gas Analysis. Part 7: Ventilation; Need for Ventilation; Ventilation Location; Effective Ventilation; Ventilation Sizing & Tables; Ventilation Calculations (Domestic); Ventilation Calculations (Commercial); Domestic Ventilation Ready Reckoner. Part 8: Gas Installer Responsibility; Commissioning Gas; Installations/Appliances; Servicing Gas Installations/Appliances; Second Hand Appliances; Gas Safety & Landlord Inspections; Gas Industry Unsafe Situations; Dealing with Unsafe Situations; Gas Escape Procedures; Reportingunder RIDDOR Part 9: Domestic Appliances; Gas Fires & Space Heaters; Component Parts of a Fire; Open Flued Radiant Convector Gas Fire; Open Flued Solid Fuel Effect Fires & Heaters; Installation of Open Flued Gas Fires; Decorative Fuel Effect Gas Fires; Fan Flued and Room Sealed Heaters; Flueless Space heaters; Commissioning & Servicing Space Heaters; Domestic Gas Cookers; Installation of Cooking Appliances; Domestic Flued Cooking Range; Commissioning & Servicing Cookers; Instantaneous Gas Water Heaters; Instantaneous Gas Water Operation; Gas Storage Water Heaters; Installation of Water Heaters; Commissioning & Servicing of Water Heaters; Domestic Gas Boilers (70W Hz); (Conventional Gas Boiler Regular Boiler); The Combination Boiler; The Condensing Boiler; Installation of Domestic Gas Boilers; Commissioning & Servicing Gas Boilers; Domestic Ducted Warm Air Heaters; Installation of Warm Air Heaters; Commissioning & Servicing of Warm Air Heaters; Domestic Tumble Dryers; Installation of Domestic Tumble Dryers; Domestic Gas Refrigerators; Leisure Appliances (Barbeques; Patio Heaters; Gas Lights); Greenhouse Heaters & Gas Pokers. Part 10: Commercial Appliances; Commercial Boilers; Commercial Boiler Control Systems; Commercial Warm Air Heaters; Commercial Direct Fired Air Heaters; Commercial Indirect Fired Air Heaters; Overhead Radiant Heaters; Commercial Laundry Equipment; Boosters & Compressors; Commercial Catering; Catering Establishments; Ventilation/Extraction in Commercial Kitchens; Commercial Cookers & Ovens; Specialist Ovens & Steamers; Boiling Pans, Hot Cupboards & Bains Marie; Grills, Griddles & Fryers; Drinking Water Boilers; Mobile Catering Units. Part 11: Non-Permanent Dwellings; Residential Park Homes; Leisure Accommodation Vehicles; Caravan Holiday Homes; Touring & Motorised Caravans; Gas Supply on Boats; Pipework Installations on Boats; Appliance & Ventilation for Boats. Part 12 Electrical Concepts & Practices; Electricity; Electrical Safety; Bonding; Safe Isolation; Inspection & Testing; Fault Diagnosis of Basic Electrical Controls;.